Clinton says McCain, Palin offer four more years of "disappointment"
(CNN) -- Former Bush adviser Karl Rove said Sunday that Sen. John McCain had gone "one step too far" in some of his recent ads attacking Sen. Barack Obama. 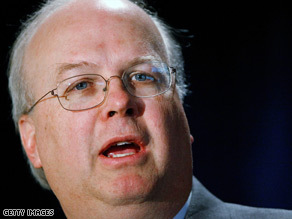 Karl Rove said both candidates are guilty of going too far in their attacks. Rove has leveled similar criticism against Obama. "McCain has gone in some of his ads -- similarly gone one step too far," he told Fox News, "and sort of attributing to Obama things that are, you know, beyond the '100 percent truth' test." The Obama campaign immediately leaped on the quote. "In case anyone was still wondering whether John McCain is running the sleaziest, most dishonest campaign in history, today Karl Rove -- the man who held the previous record -- said McCain's ads have gone too far," said campaign spokesman Tommy Vietor, in a statement sent to reporters minutes after Rove's on-air comments. Rove masterminded both of President Bush's successful White House bids. Rove said both candidates need to "be careful" about their attacks on each other. "They ought to -- there ought to be an adult who says, 'Do we really need to go that far in this ad? Don't we make our point and won't we get broader acceptance and deny the opposition an opportunity to attack us if we don't include that one little last tweak in the ad?' " he said. Obama on Saturday accused McCain and vice presidential candidate Sarah Palin of avoiding the issues to "distort" his record. "They're going to talk about pigs, and they're going to talk about lipstick; they're going to talk about Paris Hilton, they're going to talk about Britney Spears. They will try to distort my record, and they will try to undermine your trust in what the Democrats intend to do," he said at a stop in Manchester, New Hampshire. McCain campaign spokesman Tucker Bounds criticized Obama for showing "zero restraint," considering what Gulf Coast residents were facing after Hurricane Ike. Bounds said the "attacks mark a new low from Barack Obama." The Obama campaign shot back and accused McCain of "cynically running the sleaziest and least honorable campaign in modern presidential campaign history." McCain said last week that he thinks the tone of the campaign would be different had Obama agreed to appear with him in town hall meetings across the country. Both McCain and Obama laid low on Sunday. McCain attended a NASCAR race in Loudon, New Hampshire. Obama had no public events scheduled, but Sen. Hillary Clinton hit the trail for him in Akron, Ohio. Clinton repeated her campaign one-liner -- "No way, no how, no McCain, no Palin." The New York senator said "all that McCain and Palin offer is four more years of the same failed policies and wrong direction and disappointment and difficulties that have confronted our country." "Barack and I may have started out on two separate paths, but we are on one journey now," she said. Meanwhile, the Obama campaign announced Sunday that it had raised $66 million in August. The new total bests the campaign's previous high of $55 million, which came in February during his tough primary fight with Clinton. The Obama campaign said more than half a million new donors contributed in August, when the Illinois senator accepted the Democratic presidential nomination and named Sen. Joe Biden of Delaware as his running mate. The campaign had more than $77 million in cash on hand at the end of August, compared with about $66 million in July. On September 1, McCain's campaign reported raising $47 million in August. That haul also set a monthly record for the Arizona senator, whose campaign says it received a financial shot in the arm after McCain picked Palin to join the ticket. Obama has rejected public financing, calling the system "broken" -- a decision that frees him to continue raising money for November. McCain has accepted federal matching funds for his general election campaign, giving him $84 million to spend for November. The money comes with strict spending limits, but the Republican National Committee's victory fund can continue to raise and spend money on his behalf. With Palin on the campaign trail, McCain has been seeing increased numbers and energy at his campaign events. The two will hold joint town hall meetings sometime early this week. A McCain adviser said early plans are to hold the town halls in western Michigan and Wisconsin, although the exact details of where and when they will be held are still being worked out.